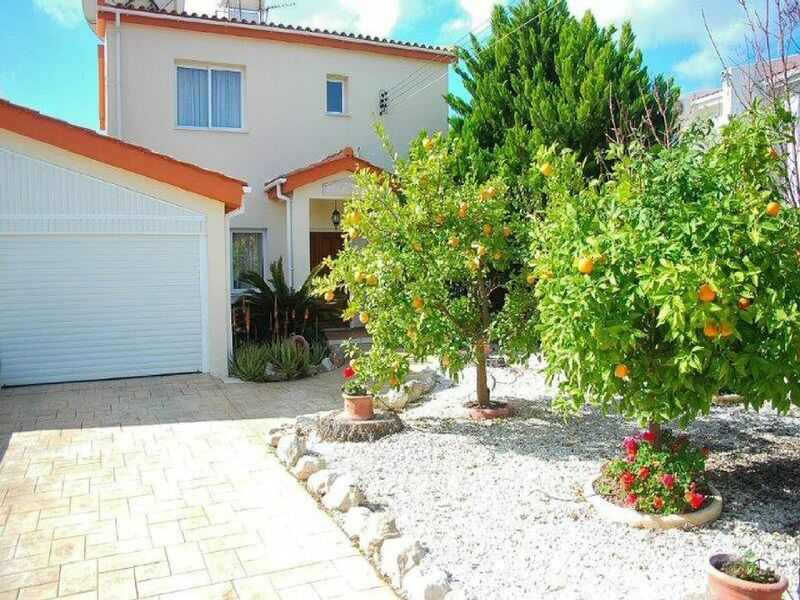 A moradia isolada HK em Paphos, chamado villa Hieros Kepos, é na pequena aldeia de Koloni, Yeroskipou, uma parte bonita de Paphos, oferecendo o turista tranquila e relaxante ambiente tranquilo, mas com toda a atmosfera local e cultura local jogado dentro A moradia geminada, de 3 camas, está idealmente situada, sendo apenas uma curta caminhada casual para a próxima aldeia de Yeroskipou, onde você pode obter os serviços de ônibus locais para o mar e muitas atrações turísticas em torno do distrito de Paphos. Várias lojas, incluindo o supermercado local, padaria, bancos, correios, e tabernas. No primeiro andar, o alojamento é em 3 grandes quartos duplos, todos com camas queen size e são totalmente en-suite com banheira ou chuveiro. Todos os 3 quartos estão bem decorados e mobilados, com secadores de cabelo, mesas de cabeceira e candeeiros de mesa, acomodando até 6 pessoas. A moradia tem ar condicionado e aquecimento para todos os quartos da villa. Dois quartos levam para a varanda do sol superior com vista para o mar e pôr do sol. No piso térreo encontra-se o confortável salão de plano aberto e áreas de jantar com vista panorâmica sobre o mar através das duas portas do chão ao tecto. Uma TV de 55 "com todos os canais de esportes BBC / ITV, Filmes, Discovery e Sky do Reino Unido, um DVD player, uma boa seleção de livros, jogos, músicas e filmes. A vila oferece acesso gratuito à Internet e Wi-Fi, além de um uso de notebook, mediante pedido. Duas bicicletas de montanha também estão disponíveis mediante solicitação. Rodovia frente para a porta da frente villa tem espaço para dois carros e há estacionamento na estrada extra disponível para pelo menos mais dois carros. O HK villa Paphos é cercado por jardins / pátio com árvores de fruto para os jardins da frente e da seção lateral da vila. Na parte traseira da casa é a privada 8m x 4m piscina, gás aquecida, se necessário durante os meses de novembro a março, uma banheira de hidromassagem deluxe spa, espreguiçadeiras e espreguiçadeiras com guarda-sóis para você relaxar aproveitando os longos dias sob o sol de Chipre, todos com excelentes vistas para o mar. Temos um forno a gás deluxe seis queimadores com forno capô churrasco, além do churrasco Chipre tradicional queimador de carvão, chamado um souvla são fornecidos junto com uma mesa de café e cadeiras com guarda-sol, além de uma mesa de jantar pátio e cadeiras com guarda-sol para as noites ensolaradas agradáveis quando só comer fora da villa em estilo afresco completará aquele dia perfeito. No terraço sombreado há uma bicicleta de exercício para o turista que deseja ficar em forma, também uma rede de balanço para apreciar a vista para o mar e ver o fim do dia chegar ao fim com o pôr do sol fantástico que vemos sobre Paphos. Quarto principal 1 Tem um banho com chuveiro e tela de chuveiro. WC e lavatório. 2 e 3 quartos Todos têm cabines de duche, não cortinas de chuveiro mais sanita e lavatórios. Lá embaixo há um banheiro de lavabo de visitantes e lavatório. Villa was beautiful and clean with private pool and hot tub plus loads of extras for our use. We were met by the owners john & ann who showed us round the villa and explained how everything worked, they supplied a welcome pack which included essentials until we got to supermarket which was most appreciated. The villa was stunning and very well maintained, pool and hot tub cleaned twice a week by john. Situated in a quiet cul de sac so you can relax but close enough to get to town, we were recommended to use rockys taxi which was excellent and we hired a car for couple of days.supermarket just a short walk from villa which has everything you need. I would highly recommend this villa as we had a fabulous week and it is really a home from home in every way and john & ann were great they could not have been anymore helpful, we will definately be returning in the near future. We have rented this house from John and Anne end of March 2019 and we have to say that this was one of the best houses we have ever rented in the Mediterranean area. The house has 3 large bedrooms and every room has its own bath room. The living area is large and nicely equipped with high quality furniture and electronic entertainment system. The TV is really very large with hundred of channels. The kitchen has all necessary tools and again everything is modern and in very good shape. The complete house is very very very clean! We loved that! The highlight is the large private pool (which we did not use because it was to chilly outside) and the large and modern hot tub (that, we used every day in the evening, what can be more relaxing than sitting in warm bubbling water and watching the stars :-). The owners John and Anne are very kind and always helpful. This house is their baby and they really take care about it. You have a problem you call John and he will fix it. There is one nice restaurant in walking distance (Costa's) which is really good for local food and several within 10 minutes driving time. Check out the South African restaurant 'The Lodge' and the French restaurant 'Gabor' which we can recommend. We can highly recommend this house! Thank you for your very kind review on your stay at our villa Hieros Kepos in Paphos, even though the weather here was awful during your stay. We hope to see you both again if in Cyprus. A great villa. The kids loved the pool and good amount of space. Bbq..gas and charcoal...everything you could need catered for. John And Ann met us and provided us with essentials until we could get to supermarket. Definitely worth hiring a car..drive on left as in UK so easy. Some great trips...turtle watching parasailing and the water park good fun. Overall, a great holiday in a lovely location. Thank you for yor kind comments and we are pleased you enjoyed your stay in our villa Hieros Kepos, Paphos. Just 10 minutes by car outside Paphos but easy to get to. Large enough house with everything you need. Owners very nice and helpful. Pool fantastic and great size with a sea view. Thank you for submitting your kind review on your stay at the villa Hieros Kepos in Paphos. For us the villa is in the perfect location, easy to find from directions supplied, short drive from airport and/or in to Pathos, Taverna in walking distance, supermarket a couple of minutes drive. It is situated in a quiet residential street, and is very peaceful and quiet. We hired a car but you could survive on taxi's/local transport from the main road, although Pathos too far to walk. John and Ann are lovely, genuine people who do all they can to make sure the villa is perfect and that you enjoy your stay. they met us at the villa to show us round and were on call the whole time we were there should we need anything, and although we didn't, it was reassuring to know. The villa is spotless, immaculately kept and fully kitted out with everything you could need. Didnt go on holiday to watch TV, but as the world cup was on, it was handy to have all the UK and freeview channels. DVD player was also handy for nights in. the Pool and Hot tub are spotless and amazing, the outside space is also well kept and spacious. All 3 double bedrooms have on suit toilets and showers, the main bedroom also has a bath. Our favourite place to sit in the evening was the bedroom balcony overlooking the villages and the sea and looking at the big starry sky. Cant report much on local beaches as we didnt bother, but Pathos harbour and town have a nice feel to them. We found it handy having a car, pathos is too far to walk but there are local buses and of course taxi's. If you do hire a car, the roads are better than ours and driving on the same side as us makes getting around very easy. A handy base if you do want to do some exploring. All in all cannot praise the place and John and Ann's efforts enough and we will definitely be returning should we want a villa holiday in Cyprus again. Thanks John and Ann for you local knowledge and tips, and for making our holiday so trouble free by ensuring the villa is 100% immaculate.Best Villa Holiday ever, relaxing, peaceful and luxurious! Louise and Dave. Thank you for your very kind review. Ann and I are pleased you enjoyed your stay at our villa and that your holiday in Paphos was a success. Hope to meet you both again if visiting Cyprus in the future. We had a delightful stay at the villa, which is very well located to explore Paphos and the Western part of Cyprus. The owners looked very well after us and were very response both before and during our stay. The house and pool is very well presented and maintained. We enjoyed our family time in Cyprus! Thank you for your review on your holidays in Paphos. We are very pleased to hear you enjoyed your stay in our villa Hieros Kepos in Paphos and that Ann & I were able to assist when required to do so. We hope you all have a super 2018 and hope to see you all again if visiting Cyprus. HK Villa Paphos: A villa Hieros Kepos está situado em uma pequena aldeia tranquila perto da aldeia de Geroskipou, Paphos. A praia local de Yeroskipou, também conhecida como praia de Rikkos, encontra-se na orla marítima de Paphos e fica a cerca de 4 minutos de carro ou a 50 minutos a pé da casa de campo Hieros Kepos, através das pistas de laranjeiras e limoeiros, levando à frente do mar e praias. A orla marítima de Paphos, o castelo forte, o porto ea estância turística são aproximadamente 6 minutos de carro da vila com o resort Coral Bay, apenas a 15 minutos de carro. Aeroporto Internacional de Paphos é de cerca de 12k, a 12 minutos de carro da vila. O aeroporto internacional de Larnaca é de aproximadamente 100k, a 50/60 minutos de carro da vila. Alugar um carro é recomendado e pode ser organizado para você incluir o transporte gratuito do aeroporto. Os serviços de táxi para transferências para o aeroporto e as excursões da ilha podem ser organizadas usando um serviço de taxi bem conhecido. A porta marítima mais próxima fica em Limassol, a cerca de 30 minutos de carro da vila. A vila de Yeroskipou, com sua histórica igreja com cinco cúpulas, fica a 3 minutos de carro, 20 minutos de caminhada casual da vila. Paphos beira-mar, os mosaicos villa romana, porto de pesca, castelo e Tumbas dos Reis estão a 10 minutos de carro da vila. O resort Coral Bay fica a 15 minutos de carro da vila. O parque nacional da península de Akamas, onde você encontra tartarugas criadoras e a vida selvagem de Chipre é de aproximadamente 25 minutos de carro da vila. Polis resort fica a 40 minutos de carro através de belas paisagens. O destacado HK villa Paphos está idealmente situado em uma pequena aldeia tranquila perto da aldeia Yeroskipou na região de Paphos. As comodidades incluem um supermercado local, no local, padeiros para pães frescos e bolos locais, correios, bancos, vários bares e tavernas, todos a curta distância da villa Hieros Kepos. Nós recomendamos contratar um carro para visitar muitos locais históricos de interesse na Ilha de Chipre. Polis Village é 10 km Nortth de Paphos e ainda uma parte relativamente virgem de Paphos com suas tavernas e lojas locais. Ainda hoje mantém um modo de vida mais relaxado. Latchi, a outra cidade principal nesta área de Polis. Novamente há algumas lojas aqui para turistas, e uma série de tabernas e restaurantes tradicionais, todos os quais estão próximos da praia e do cais de barcos. Para aqueles que procuram esportes aquáticos, Latchi tem um centro de esportes aquáticos, onde você pode alugar um barco ou mesmo mergulhar. Petra Tou Romiou (local de nascimento de Afrodite) - 20 km a leste de Paphos. Segundo a lenda, Afrodite, deusa do amor e da beleza, surgiu das ondas neste local maravilhosamente bonito. O nome grego, Petra tou Romiou (The Rock of the Greek), está associado à legendária fronteira-guarda dos tempos bizantinos, Dighenis Akritas, que manteve os sarracenos aristocráticos na baía com incrível força. É dito em uma dessas lutas que ele ergueu uma grande rocha (Petra) em seu inimigo. Museu de arte popular de Yeroskipou. O nome da aldeia vem da palavra grega "Hieroskipos", o jardim sagrado de Afrodite. Uma colecção fascinante de artes e ofícios populares de Chipre é reunida na casa conhecida como Hadjismith. A vila de Yeroskipou tem a igreja Ayia Paraskevi, a 3 km a leste de Paphos. Uma das igrejas bizantinas mais interessantes e atraentes da ilha, datada do século X, com uma basílica abobadada, uma nave e dois corredores sobrepostos por cinco cúpulas, com afrescos posteriores datados do século XV. A aldeia de Kouklia é o Templo de Afrodite, a 14 km a leste de Paphos. Este é Palaepaphos, Paphos Velhos, um dos lugares mais célebres de peregrinação do mundo grego antigo e uma vez que um antigo reino da cidade de Chipre. Aqui você encontrará as ruínas do famoso Templo de Afrodite. Os vestígios mais antigos datam do século XII B. C. O templo era um dos lugares mais importantes de culto e peregrinação do mundo antigo até o século III-IV. A. D. O museu no Lusignan Manor é pequeno, mas impressionante, com muitos achados da área. Mosteiro de Ayios Neophytos - Localizado a 9 km a norte de Paphos. Foi fundado em cerca de 1200 pelo ermitaño e escritor neófito chipriota. O Encleistra ou cerco esculpido na montanha pelo eremita contém alguns dos melhores afrescos bizantinos que datam do século XII ao XV. Na igreja do mosteiro existe uma interessante coleção de ícones e restos de afrescos do século XVI. Mosteiro Chrysoroyiatissa - Localizado a 40 km a nordeste de Paphos. Vire à direita antes da vila de Stroumbi e você encontrará o monasterio situado em belos arredores. É dedicado a Nossa Senhora da Romã de Ouro e foi originalmente fundado no século 12, mas o edifício atual data de 1770. Uma cerimônia religiosa impressionante e celebrações são realizadas no dia 15 de agosto.